Pyroxene (Ca, Fe, Mg)2Si2O6 (rarely Na, Al or Ti in the brackets). Quartz SiO2 (a particular crystalline form of silica). random thermal motions keep the magma well mixed. The ocean gradually cools and the first minerals begin to crystallise, with a well-defined chemical composition. Among these will be silicates rich in magnesium and iron, such as olivine. These are dense silicates and so tend to sink downwards. Other minerals that crystallise at the comparatively high temperatures at this stage are calcium-aluminium-rich silicates that are rich also in silicon and oxygen. Feldspars, (K, Na, Ca)AlSi3O8, are an important example. Such silicates have comparatively low densities and so tend to float upwards. Pyroxenes, (Ca, Fe, Mg)2Si2O6, also float upwards. This mixture of feldspars and pyroxenes constitutes basaltic-gabbroic rocks (Table 6.1). The process of separation by crystallisation is called fractional crystallisation. Note that different elements partition differently between different minerals. The formation of feldspars, particularly those rich in calcium, is moderated by the effect of pressure. At pressures in excess of about 1.2 x 109Pa, calcium and aluminium crystallise within denser minerals that do not float upwards. This means that feldspar would not emerge from depths greater than those at which the pressure reaches 1.2 x 109 Pa. Such pressures are reached at depths ranging from 40 km in the Earth to 250 km in the Moon, so the larger terrestrial bodies would have been more vulnerable than the smaller bodies to pressure moderation of feldspar formation. Complete differentiation of the uppermost mantle might well not occur. Partial differentiation would yield a surface layer rich in feldspar, plus other silicates rich in iron and magnesium, notably pyroxene. Nevertheless, in all cases the formation and subsequent cooling of a magma ocean would result in the surface layer being depleted in iron and magnesium, and enriched in silicon, oxygen, and in metals such as calcium and aluminium. The upper mantle would then consist of peridotite correspondingly somewhat depleted in elements such as calcium and aluminium. A crust-mantle distinction would thus be established, as in Figure 6.4. Fractional crystallisation is not the only way of creating a crust. This can also occur through the partial melting of a solid outer mantle consequent upon a rise in internal temperatures, or a reduction in pressure. Partial melting can occur whenever there is a mixture of minerals. As the temperature rises, or pressure falls, there will come a point where a proportion of the mixture will melt, such that the composition of the molten material is different from that of the original solid mixture. □ Why does pressure reduction promote melting (see Figure 4.11)? This is because when the pressure is reduced the melting point of a substance is also reduced (except for water - see Question 4.7). Figure 6.4 Formation of a crust by differentiation in a peridotite mantle. The onset of partial melting is marked by the emergence of a liquid of distinct composition. For example, consider an upper (solid) mantle with a peridotite composition, subject to (local) warming. The peridotite will typically consist of three components: olivine and two types of pyroxene, namely orthopyroxene and clinopyroxene, that differ in their calcium content. As the temperature rises it reaches what is called the eutectic temperature of the peridotite, which is lower than the melting temperatures of the components. At this temperature a liquid appears of a specific basaltic-gabbroic composition. Regardless of the proportions of olivine and the two sorts of pyroxene in the peridotite, the composition of the liquid (and its eutectic temperature) is fixed until all of one of the three components has melted. Before this occurs, the liquid, being less dense than its surroundings and therefore buoyant, will rise into a cooler environment. It then solidifies to form basaltic-gabbroic rocks - notably richer in silicon and oxygen than peridotite, as pointed out earlier. In the case of the Earth, the olivine in the upper mantle peridotite will be rich in magnesium. Indeed, the upper mantle contains only about 8% iron by mass. The partial melting does result in some concentration of iron into the melt, and so the Earth's crust is slightly richer in iron than the upper mantle. Note that if the Earth had a magma ocean and an early crust, this would long ago have been recycled into the mantle by plate tectonics (Section 8.1.2), and that the crust today is derived from partial melting of the upper mantle. Though Venus has little by way of plate tectonics it is thought that the whole crust is recycled every few hundred million years, in which case any crust from a magma ocean would also have been recycled (Section 8.2.7). In the case of the Moon, the maria infill is basaltic, having been derived by partial melting of the mantle (Section 7.1.2). Partial melting also occurs on the icy satellites of the giant planets. For example, in the case of a mixture of water ice with various ammonia hydrate ices (e.g. NH3.H2O) there is a eutectic temperature of 176 K at a pressure of about 105Pa, where a liquid consisting of two parts H2O and one part NH3 emerges. The melting temperatures of H2O and NH3 at about 105 Pa are 273 K and 195 K respectively. Once a crust is established, further partial melting can occur within the crust to produce additional differentiation. The outcome is more than one crustal type, and a rich variety of surface rocks. Table 6.1 gives a few examples and, by way of example, where they are found in the Earth and the Moon - more on this in Chapters 7 and 8. The discovery at the surface of a planetary body of materials that could have resulted from partial or total melting is evidence that such melting has occurred in the past. This indicates that interior temperatures were sufficiently high to cause the melting. In one sentence, state why pure silica (SiO2) is not subject to partial melting or partial crystallisation. Volcanism covers all processes by which gases, liquids, or solids are expelled from the interior of a planetary body into the atmosphere or onto the surface. On icy worlds the processes are collectively called cryovolcanism. Volcanism and cryovolcanism start with partial melting in the interior, of rocky materials and icy materials respectively. The magma, being less dense on average than the surrounding materials, finds its way to the surface through fissures. En route, rocky magma will dissolve volatile substances such as water, and the magma might partially freeze as it approaches the surface. Volcanism and cryovolcanism lead to further chemical differentiation. For example, granitic-rhyolitic rocks (Table 6.1) are richer in silicon and oxygen than basaltic-gabbroic rocks. The exact composition of the magma, its temperature, and volatile content determine what is called the style of volcanism. There are two extreme styles. In explosive volcanism the eruption is very violent, because the magma is viscous and rich in dissolved volatiles. Rocky materials, rock fragments, and ash are erupted at high speeds. By contrast, in effusive volcanism the volatile content is low, or has become low by the time the magma reaches the surface, and the magma also has a low viscosity. Consequently there is a surface flow of molten rock (or icy materials), called lava. Viscosity (which depends on composition and temperature) and volatile content are continuous and somewhat independent variables, so there are mixed styles too, including volatile-rich low-viscosity magma that erupts explosively yet leads to lava flows. The details of each style are influenced by the rate of eruption and by the gravitational field. In explosive volcanism the density of any atmosphere and the winds help to determine the spatial distribution of the products. Given so many different factors, it is not surprising that a wide range of volcanic features is found. Here are some examples. The 'classic' volcanic cone (Figure 6.5(a)) is the result of explosive volcanism where the rate of eruption is modest. At modest eruption rates and low viscosities, a sequence of separate lava flows can create shield volcanoes (Figure 6.5(b)), which derive their name from their resemblance to a warrior's shield with a central boss. Less familiar are vast volcanic plains created by low-viscosity lavas flowing at high rates from channels and tubes that radiate out from a vent or fissure. We need to distinguish volcanic craters from impact craters. Many volcanoes have summit craters (Figure 6.5(a), (b)) and these are called calderas. There are also volcanic pits and depressions that do not sit on mountains (Figure 6.5(c)). Some of these forms bear a superficial resemblance to impact craters, but in most cases a more careful morphological examination will reveal their volcanic origin. You can get some sense of this if you compare Figure 6.5 with Figure 6.10. Figure 6.5 (a) Volcanic cone. (b) Shield volcano with summit crater. (c) Volcanic pit. gabbro the intrusive form, and granitic-rhyolitic rocks, where the extrusive and intrusive forms are, respectively, rhyolite and granite. The extrusive and intrusive forms have much the same mineral content, determined by partial melting. Thus, basalt and gabbro are each mixtures of the minerals feldspar and pyroxene, and rhyolite and granite are each mixtures of feldspar and quartz. The intrusive forms are coarser grained, i.e. have larger crystals. 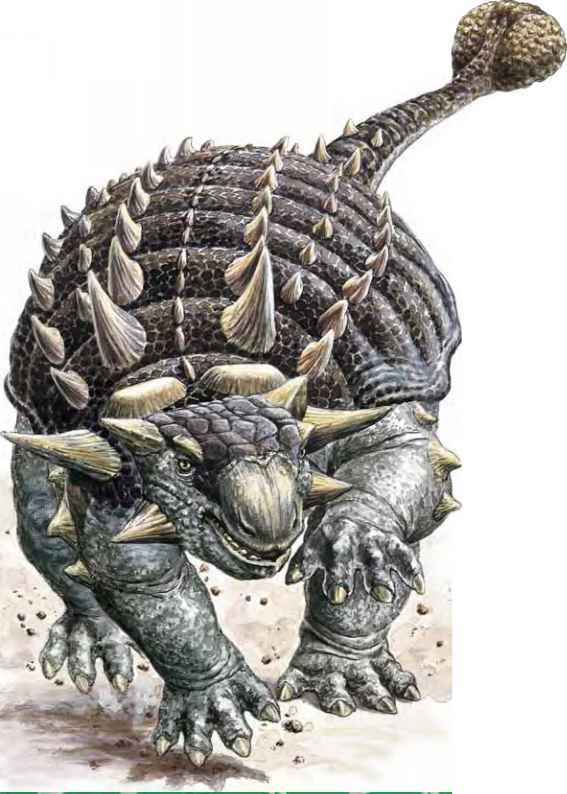 This is because they solidified more slowly in their underground environments than did the rocks extruded onto the surface. Rocks produced from magma, whether intrusive or extrusive, constitute what are called igneous rocks. Table 6.1 lists some important igneous rocks and their corresponding mineral content. Why could you conclude from its location that the summit crater in Figure 6.5(b) is unlikely to be of impact origin? How could you confirm your conclusion by surveying the composition of the surface (assume a rocky world), and any layering around the crater perimeter? 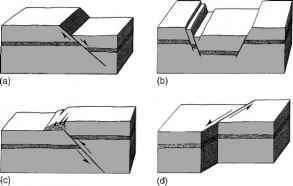 Tectonic processes are those that cause relative motion or distortion of the lithosphere. They derive their name from the Greek word for carpenter - tekton. Volcanism can be associated with tectonic processes, but this need not be the case. Tectonic features can vary in size from a few kilometres to planetary scale. of about 50 km. Part of one of its walls is shown in Figure 6.7. Normal faults and grabens are common not only on the Earth, but on other bodies, such as Mercury, the Moon, Venus, Mars, and some of the large satellites of the giant planets. A thrust fault, or reverse fault (Figure 6.6(c)) usually results from lithospheric compression. A strike-slip fault (Figure 6.6(d)) can arise from compression or tension, but is characterised by motion that is predominantly horizontal and not vertical as in the other examples. Thrust faults and strike-slip faults are seen on the Earth and on many other planetary bodies. Compression can also cause bending and upthrust of the lithosphere, in extreme cases resulting in mountains, e.g. the Maxwell Montes range on Venus (Section 8.2.6). The Earth seems to be unique in that its lithosphere is divided into a global system of many plates in motion with respect to each other, predominantly laterally. This lateral tectonics produces mountain chains such as the Himalayas in Asia, the Alps in Europe, the Andes in South America, and so on. This dominant aspect of terrestrial tectonics, plate tectonics (Section 5.1.1), is the subject of Section 8.1.2. Other planetary bodies have lithospheres that are not divided into plates, and consequently tectonic motion is predominantly vertical. The extent to which a lithosphere has experienced tectonic processes depends on its composition and its thermal history. If the lithosphere is thick, or rigid, few tectonic features will be present, and those that are will be mainly due to vertical motion. Conversely, the extent and nature of tectonism provides important information on the thermal evolution of the body. Further discussion of individual planetary bodies is in Chapters 7 and 8. □ Would you expect icy lithospheres to be subject to tectonic processes? Yes indeed, though their expression will reflect differences between the behaviour of ices and rocks. For example, except at very low temperatures, icy materials are more plastic than rocky materials and have much less strength. This will rule out the building of high icy mountains. We now shift emphasis away from processes that emplace surfaces to those that modify them, though there is no sharp division between emplacement and modification. The most ubiquitous process in the Solar System is impact cratering. You will recall from Chapter 3 that interplanetary space is populated with large numbers of small bodies in orbits that can intersect those of planetary bodies. It is therefore to be expected that the surfaces of planetary bodies will bear the scars of individual impacts. Indeed they do, in the form of impact craters. The lunar craters are a familiar consequence of impact (Figure 6.8(a)), and 174 impact craters, or structures clearly produced by impact, have been identified on Earth, the best known being Barringer Crater in Arizona (Figure 6.8(b)). where m is the mass of the projectile and v is its speed with respect to the surface. The value of v depends on the relative motions of the projectile and the planetary body, and on any changes in projectile speed during the encounter, notably through its acceleration by the planetary body's gravity. Orbital speeds and the acquired speeds are each about 10kms-1, to an order of magnitude. Therefore, to an order of magnitude v is 10kms-1. In the case of the Earth, the impact speeds are in the range 5-70 km s-1. Such high impact speeds mean that even a small mass can excavate a considerable crater. □ What is the kinetic energy of a small body with a mass of 108kg and with a speed of 15kms-1? From equation (4.1) the kinetic energy is Ek = 108kg x (15000ms-1)2/2« 1016 joules. This is the energy that would be liberated by the explosion of about 3 million tons of TNT, and it is also about the energy that was required to excavate the 1.2 km diameter Barringer Crater. This crater was excavated by an iron meteorite, and so the radius of the meteor at the Earth's surface would have only been about 15 metres if it had been travelling at 15kms-1. before being brought to rest. It does not get far because the speed of the projectile at impact exceeds the speed of seismic waves in the surface material, which at most will be about 4 km s-1. Therefore, the material ahead of the projectile gets no 'advanced warning' of the impact, and so cannot move away. This leads to the piling up of a sudden and enormous compression - a shock wave. The pressures generated exceed the strength of the materials by factors of 103-104, and so the surface materials and the projectile are highly fractured. At the same time nearly all of the kinetic energy of the projectile goes into heating the projectile and its immediate surroundings. Most of this material is vaporized and this produces a violent explosion. During stage 1 surface materials are ejected at high speed. In stage 2 (Figure 6.9(b)) shock waves spread out from the site of impact, fracturing and melting subsurface layers and throwing huge quantities of material outwards. The immediate result (stage 3, Figure 6.9(c)) is a hole with a volume greatly exceeding the volume of the projectile itself. The hole is rimmed with the distinguishing characteristic of overturned rock strata. Subsequently, modifications can occur by a variety of processes, as you will see. 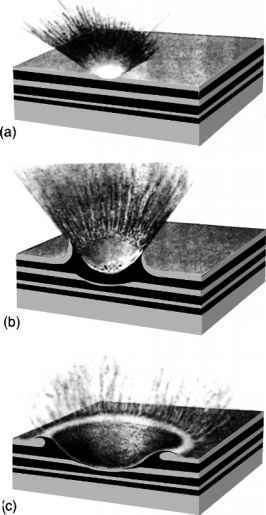 The direction of the projectile has little effect on the shape of the crater unless it impacts at grazing incidence - the explosion and the shock waves spread out uniformly from the point of impact. 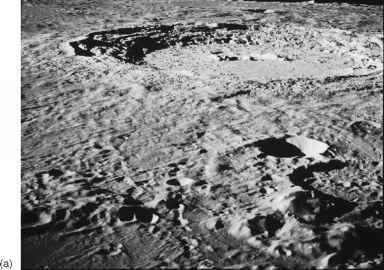 Craters are thus roughly circular, unless produced by a near grazing impact, when the crater will be elongated in the direction in which the projectile was travelling. 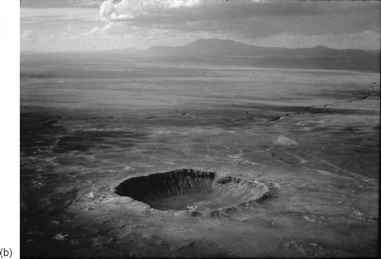 The volume of a crater is roughly proportional to the kinetic energy of the projectile. It also depends on the gravitational field of the planetary body, and on the strength and density of its surface layers. For example, for a surface of given strength and density, the crater size diminishes as the gravitational field increases. This is because the surface materials are held down more strongly. Also, there is a big difference between rocky surfaces and icy surfaces, partly because of the lower densities of icy materials, and partly because of the lower strength of icy materials, unless they are far below their melting points. For a projectile of specific kinetic energy and a specific surface gravitational field, a crater produced in an icy surface will be roughly double the diameter of one produced in a rocky surface.